Gunther is completed after a week of long hours. He is a Libby kit by Cindy Musgrove and my second attempt at reborn painting. I tried some fine details on Gunther to achieve a "real" complexion. He has rooted eyelashes and fine barely there eyebrows both in a light brown. Gunther is 23" long and weighted at only 4lbs because the collector preferred a well disturbed lighter weight. 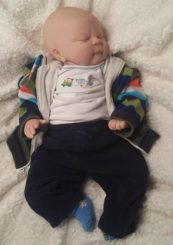 He went home with the outfit seen in the last pictures, a modified bottle, a sleeper outfit, and a blanket.